So I did it again, Mi! For the second time in my life, I celebrated Ganesh Chaturti without Kozhukkattai. What to do? I wouldn’t exactly say no takers, but we both decided that they taste sweeter when Vidur’s home. So I compromised with the family favorite – the paruppu payasam, which Sury enjoyed. It felt very odd not to make a big deal. I recalled fond memories of years past when we would make our own Ganesha with red mud. When Vidur was little, we would give him dough to make his little Ganesha and we were so amazed when he came up with quite a cute one, modaks, moonjoor, and all. We would wake up early to get started with making all the kozhukkattais and roasting sesame seeds for the ellu urundai (til ladoo) and this would go on well past lunch to conclude with the steaming for the ammini kozhukkattai. Sigh. I missed that. I wish I had made the ellu urundai, Mi. Supposed to be an important part of the festival, no? I also skipped Krishna Jayanti this year, stopping at only the basic neivedyam of aval, milk, curd, chana, jaggery, butter and fruits. When Vidur visits, we will probably do the “festival package” and make all the yums. I don’t think the gods would mind, do you? I do start my day with prayer and lighting the lamp. And feel that is enough. After all, you did convince me that devotion is in the heart. I have to admit though, I now have a gentle craving for modaks! What we did do was have a pleasant day at home since it was a holiday. We binged a bit on Three’s Company and then watched some more comedy. Then we got on with our usual routine, laughing and cracking jokes. 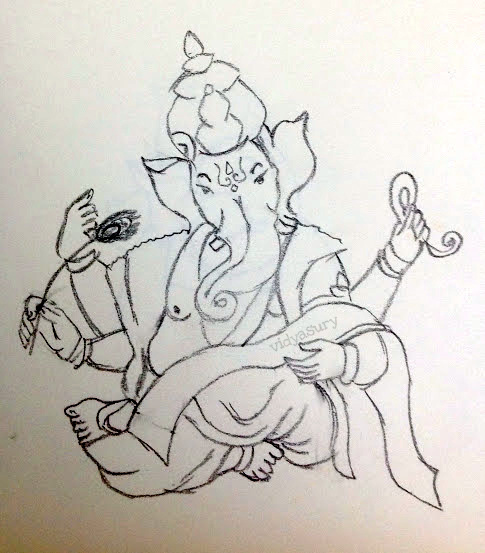 I found some sketches I had made of Ganesha some time back. See, here is one. I seem to have freaked out and done another eight. Ha ha! This is a half-assed phone camera pic. I supposed I could have scanned it, but I figured I’d do that after touching it up a bit. Sometimes I wonder what I’ll do with all the Ganeshas I’ve collected. (Ganeshas – plural – really?). Maybe I should find a way to display them. Let me think about it. Wish you were here – what fun it used to be to discuss all kinds of crazy changes! Festivals aren’t just as much fun without kids, are they? Before the twins came along we hardly celebrated as much as we do now. What is kozhukkattai? Are they steamed modaks?